The Sharp Scissors Lady: Tutorial Tuesday: Remember When? Several months ago I shared one of my favorite fresh fruit recipes- and in honor of fruit NOW being fully in season, now may be the time to try your hand at making this YUMM-O snack! I'm pretty sure this recipe has an addictive additive in it somewhere... one taste and you'll be begging for more! 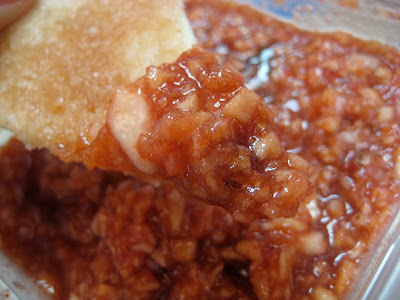 The best part about this recipe, it is ridiculously forgiving... you'll see! Ingredients: (for the chips) flour tortillas, butter, cinnamon & sugar. Start by mixing a cup-ish of sugar with a hearty amount of cinnamon (I'm NOT cinna-shy, so load it up if you like!). Mix the cinnamon and sugar well, this is surprisingly important... wink! Next, separate your tortillas. I like to work in batches of three tortillas! Cut each tortilla into 8 even triangles. Before I owned a pizza wheel, I used to wash my scissors (sharp ones, of course!) and I would snip my tortillas into triangles! It is super important to place a layer of aluminum foil on top of your cookie sheet because this recipe is a little bit messy and sticky before your finished product cools! 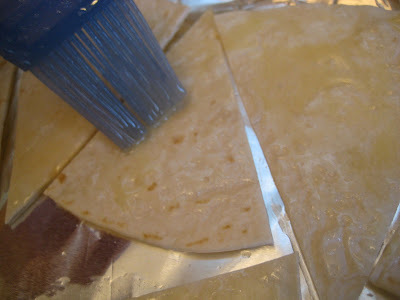 Lay as many triangles on your cookie sheet as you can, but make sure to leave "cracks" between your tortillas. Melt a stick of butter (I always use real butter) and brush a semi generous coat of butter on each triangle. Next, generously sprinkle your cinnamon & sugar mix over the tortillas... don't be tempted to get stingy on your butter or cinnamon & sugar, you won't be eating this everyday (...or will you???)! Bake at 350* for 8 minutes. I lay my "chips" on a fresh sheet of aluminum foil to cool. Once they have cooled completely, I move them to a Ziploc bag! The "Salsa" side of this recipe is even more forgiving! ***The original recipe included kiwi and excluded the pear... I don't care for kiwi so I swapped the fruits. I'm pretty sure that you can add/change fruits to your hearts delight, but I would keep your selections to non-canned (except maybe pineapple... hmm, now that sounds yummy!) and non sugar added frozen fruits. Personal Notes: The chips can be made up to two days in advance, but the salsa will begin to ferment after 48 hours. Use the freshest fruit that you can get your hands on... then kick back and enjoy the compliments! I personally make 10 tortilla's worth of chips for a single batch of salsa! This stuff is wonderful! I was just thinking about making some more. Now I suppose I have no excuse. Please eat a few bites for me!! !